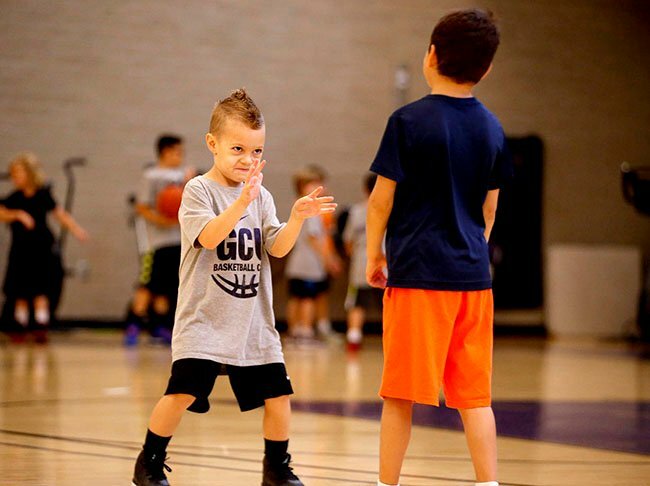 “Bring it on!” says one young competitor at the Dan Majerle boys’ basketball camp. The roars of the crowd could be heard outside the building as Grand Canyon University basketball players competed in an intense game. Swish. Roar. Swish. Roar. And on it went, getting louder by the minute. But the venue was the Lopes Performance Center, not GCU Arena, the opponent wasn’t another college team, and this was a very different type of competition. This was a contest against participants in the Dan Majerle camp, for boys ages 6-14, to see who could make the most shots, and the players were feeling the heat of the fired-up boys rooting for their pint-sized peers to knock off those grizzled old twentysomethings before sprinting outside (they sprint everywhere, of course) to enjoy a chicken finger lunch. How daunting was the pressure? 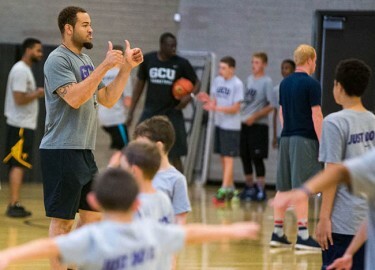 It’s just one of the many rituals that make the camp a full day of fun, and the joy is so profound that GCU employees stop by just to watch the kids run around, hoist shots and run through drills. 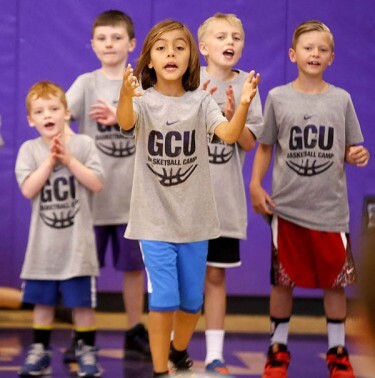 This was the first of three weeks of boys’ camps, and there’s still time to sign up for the other two — June 20-23 on campus and June 27-30 at Scottsdale Community College. Click here to get more information and register. Grandy Glaze gives a big thumbs-up to working with the youngsters. There also are opportunities for girls ages 7-12 to have just as much fun. The Lil Lopes Camp is scheduled for Monday and Tuesday, June 13-14, and the Lopes Prospect Camp will be Wednesday-Thursday, June 15-16. 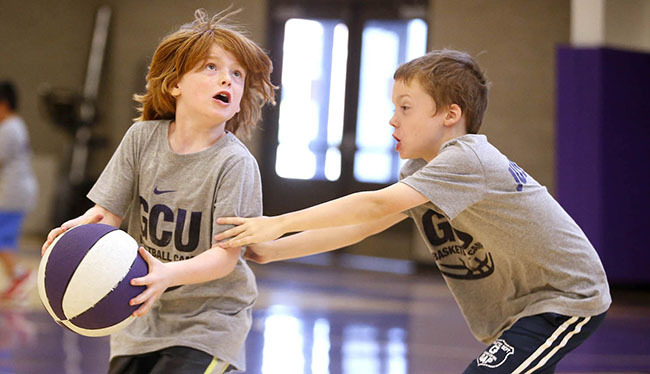 And for information on all the sports camps at GCU, click here. The Majerle camp, in its fourth year, figures to just about equal or even exceed its 2015 numbers. There were 156 boys there this week, and about as many already were signed up for the next session with another week to add significantly to that number. 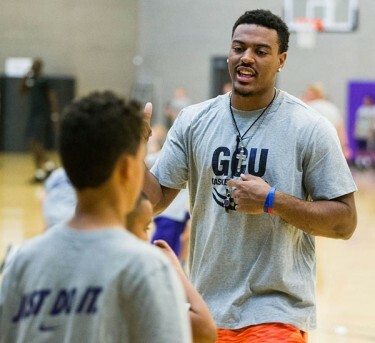 The coaches are a mix of the GCU staff plus a large number of players, both current and former, and the players say they get as much out of it as the kids. To say the campers get into the drills is an understatement. Glaze has been on campus this summer to work out in preparation for what he hopes will be a professional career — he has a tryout with the Philadelphia 76ers next week. But he still devoted this week to working at the camp, partly because of an important side benefit — he feeds off the energy. “You wake up in the morning and you need a little coffee, a little boost. But once you get in, these kids are your coffee, they’re your sugar, they’re your boost,” he said. “They all have energy, and it’s contagious. Positive energy is contagious. Glaze, who was Second Team All-Western Athletic Conference this season and won the Riley Wallace Award, given to the top transfer in Division I basketball, has worked on his shooting and ballhandling this summer. He is determined to get an opportunity somewhere, even if it means going to Europe. “My profession is basketball now,” he said. “I’ve just to make sure I’m ready. I’ve got to stay in shape and make improvements in my game. Hair flying, arms extending — the one-on-one competition is intense, too. Estelle also hopes to get a chance to play professionally but is prepared to pursue a regular job if that doesn’t pan out. For now, he’s just happy to be part of the camp scene and listen to the kids tell him funny things — for example, one camper told him how sore he was going to be the next day, as if he is 6 going on 60. “It’s such a good feeling to see them enjoying the game,” Estelle said. Especially when they can beat the players. It makes those chicken fingers taste even better.